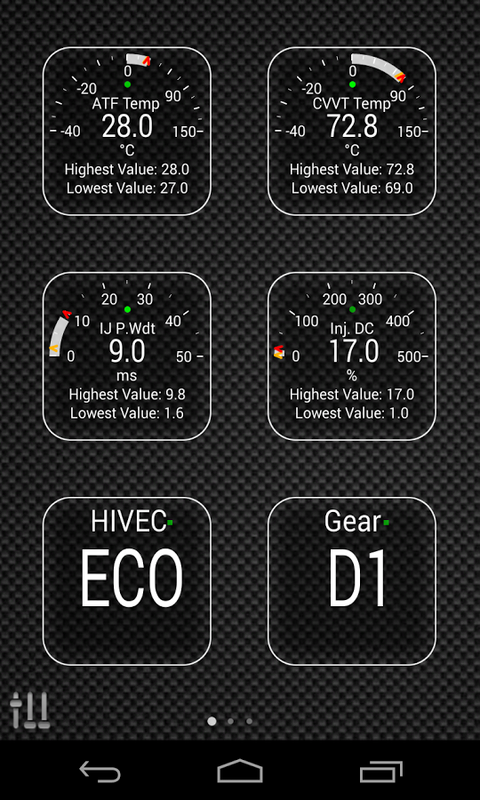 Monitor specific Hyundai parameters in real-time, including engine and automatic transmission advanced sensor data by adding this plugin to Torque Pro. For cars with automatic transmission, Lockup is really cool to monitor during a long road trip or even while driving in the city. As described on Hyundai Service Manuals, the Damper Clutch Lockup shows in real-time the actual Torque Converter lockup percentage, and as it approaches 100% the slip should be near zero. Hyundai Advanced requires the latest version of Torque Pro installed in order to function. This is *NOT* a standalone application and will *NOT* work without Torque Pro. Note: Some sensors will be calculated real-time based on others. Make sure that you keep all sensors to avoid calculation errors. 4) Select the appropriate sensor from the list. Sensors provided by Hyundai Advanced begins with "[HADV]" and should be listed right after the time sensors in the top of the list.